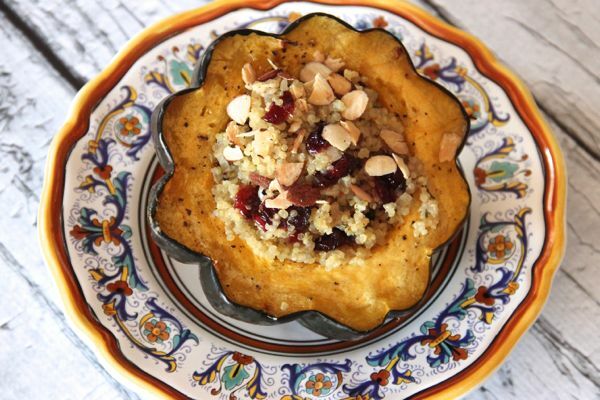 In this recipe, roasted acorn squash halves provide a “bowl” that holds a simple yet delicious quinoa pilaf. Fall cooking often has me craving pumpkin, apples, cinnamon, nutmeg and all those comforting, cozy and warm flavors. Squash is one of those fall flavors I tend to neglect but it truly rivals the other fall flavors. Winter squash is very healthy for you as it is a great source of beta-carotene, a good source of both fiber and vitamin C, and best of all is low in calories. Some of the most commonly found varieties of winter squash include Pumpkin, Acorn, Butternut, Turban, Hubbard, Delicata, and of course the unique Spaghetti squash which can be used in place of pasta once cooked. Roasting squash caramelizes the flesh and adds the perfect touch of sweetness. This particular recipe is a versatile one as you can easily tweak the ingredients added to the quinoa pilaf – mushrooms, goat cheese, fresh herbs, pecans, cherries … so many variations! Squash is low in calories, but a rich source of dietary fiber, anti-oxidants, minerals, vitamins. Squash is rich in phytonutrients and disease fighting antioxidants. Preheat the oven to 425 degrees F and scoop out the seeds and innards of each squash half. Drizzle the squash halves with olive oil and rub it in with your hands for an even coating. Sprinkle with salt and pepper and place the halves on a baking sheet, cut side up. Place the halves in the oven and roast until the squash is fork tender about 30-45 minutes (roasting time will depend on the size of your squash). While the acorn squash is roasting, heat the remaining 1 tablespoon of olive oil in a saucepan and add the shallot and cook until softened, about 3 minutes. Add the quinoa to the shallot and toast gently for 1-2 minutes without browning or burning the quinoa. Add the broth and oregano and bring to a boil then reduce the heat to low, and cook, covered, until liquid has been absorbed, about 15-20 minutes. Just before the quinoa finishes, add the cranberries and stir well to mix. 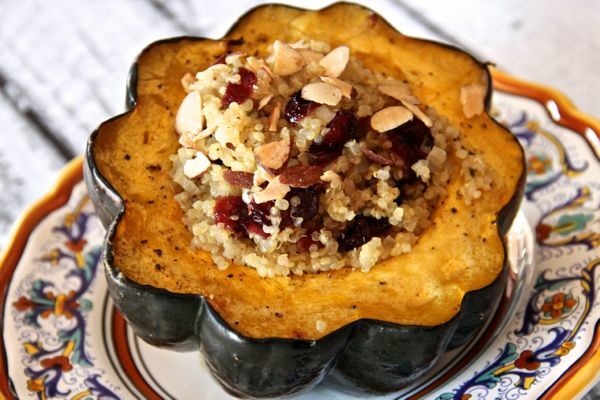 Add the almonds and salt and pepper to the quinoa pilaf and stuff the acorn squash halves with the quinoa pilaf and serve.